TWEET and WIN a McCormick Recipe Inspirations & $10 Crate & Barrel Gift Card! That's right, you get both just for tweeting! What could be easier than that? I did it and a few minutes later, was notified via tweet that I WON! I sent a direct message and that was it! HURRY, it's only good for the 1st 100 people who tweet! The One2One Network recently gave the opportunity to receive, listen to and review a new and up-coming British band, One eskimO. Before receiving their CD, their name didn't ring a bell and I thought that I had never heard of them before. When I began listening to their music, they sounded really familiar to me! Well, come to find out... I had heard one of their songs before and didn't even know it! KANDI is the song that I had heard on the radio and enjoyed several times, it's a beautifully emotional song. You may have already heard it too since it's the most played song on all adult rock radio for the past 4 weeks and counting. One eskimO, “Kandi” Hit #1 on the Mediabase Radio Chart making it the most played song on all adult rock stations in the US! Billboard Magazine calls One eskimO's self-titled debut album "...catchy, ambient pop." and Los Angeles Times Magazine hails the song "Kandi" “a beautiful, aspirational track.” The album is available in stores now. Why? Why? Why, did you need him? One eskimO are a four member alternative rock group from London, England consisting of Kristian Leontiou (vocals), Adam Falkner (drums), Pete Rinaldi (guitar) and Jamie Sefton (bass and horns). Frontman Leontiou has had past experience in the music industry in which, he was marketed towards the popular culture and in 2004, had a top ten hit in the UK and a widely successful album. Uncomfortable with the music and image he was pressured into presenting, Leontiou broke away from the pop scene and embarked on the One eskimO project. One eskimO has a musical heart of gold. Their songs are touching, moving and motivating. Each and every one of us can relate to atleast on of One EskimO's songs on their album. The messages they relay in their songs are profound and thought provoking. Whether it's love, heartbreak, success or defeat, we have all been there and One EskimO's songs will take you there. One eskimO is music for every age. 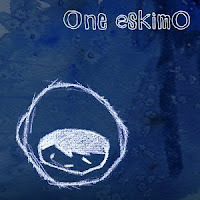 No matter what type of music you listen to now, I'm sure that you would enjoy the music of One eskimO. I love it, my mom loves it and so does my 6 year old daughter!